Hold this if you are Rich. This token is for pure brag of richness in the cryptomarket. 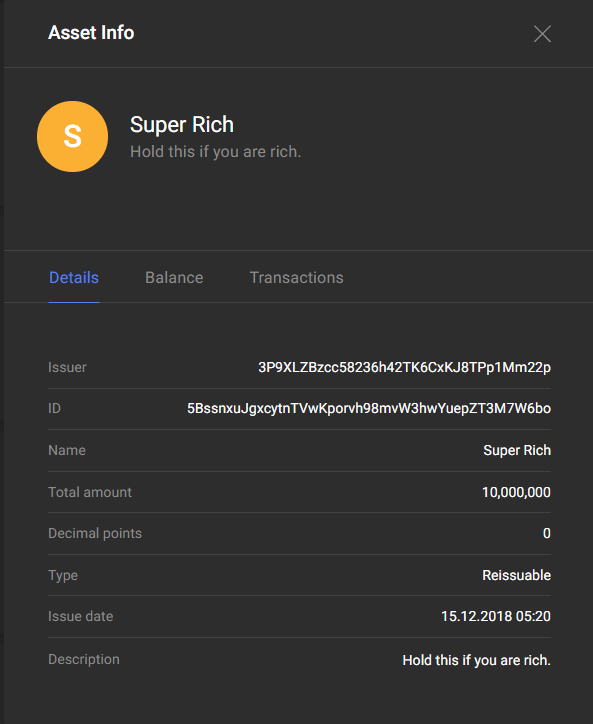 Whoever holds this token in the Waves Wallet is proving his wealth without having to show his balance of other criptos. There are no decimals in the supply, because each super rich represents the wealth level of the holder. You can say this is the first status token in the market. Just type the ID “5BssnxuJgxcytnTVwKporvh98mvW3hwYuepZT3M7W6bo” on the Waves Decentralized Exchange, buy the token and hold for glory. I typed it and it’s on my exchange what’s next? Buy the offers on the exchange and hold to show your rich power. Only 6000000 super rich will be in sale right now in limited offers. This token is for glory status wallet. Quantos supericos já foram vendidos? me doe algumas super rico. Give me some super rich.